Los Angeles, California — October 5, 2017 — Legendary Rock and Roll Hall of Fame inductee, Grammy winner, New York Times best-selling author, co-founder and chief lyricist of The Beach Boys, Mike Love, is set to release a special double album on November 17 through BMG. Entitled Unleash the Love, the album will feature 13 brand new songs and 12 re-recordings of Beach Boys classics. The album is produced by Grammy-winning producer Michael Lloyd. To listen to the title track off of the album, “Unleash the Love,” click here. Unleash the Love will be available for pre-order on October 27th, and will be released in CD, vinyl LP, and digital formats. As lead singer and front man of The Beach Boys, Mike Love has taken the sounds of America's band to every corner of the globe — playing for crowds of up to 750,000 fans. Mike has co-authored more than a dozen hit singles, cementing The Beach Boys as one of the only artists to have produced twelve Top 10 Singles within 5 years. With iconic and timeless tracks like “Good Vibrations,” “Fun, Fun, Fun,” “I Get Around,” and “Kokomo,” The Beach Boys have created some of the most performed songs in pop music history. 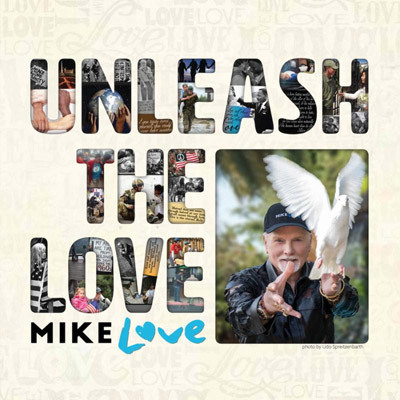 Unleash the Love is a testament and continuation of Mike Love's remarkable career. The new tracks range from rock, gospel, R&B, and pop and celebrate Love's connection to the teachings of Maharishi Mahesh Yogi and his journey to find personal love and peace. Love's history with Transcendental Meditation anchors a number of songs including “Ram Raj” a song celebrating the divine; “Pisces Brothers,” a tribute to the late George Harrison and the experiences they both shared in India in 1968; and “Cool Head, Warm Heart,” a breezy pop song which borrows its title from a saying by Maharishi Mahesh. The album also includes a prayer for the planet, “Only One Earth.” As with all of the new tracks, a sense of concern is infused in every song: to change what you can, to transcend, connect to the planet and the people around you and give into the power of love. In addition to the collection of Mike Love original songs, the special double album features new versions of classic hits such as “California Girls,” “Help Me Rhonda,” and “Good Vibrations,” recorded with members of the touring Beach Boys' supporting band. Earlier this month, the paperback version of Mike Love's New York Times best-selling memoir, Good Vibrations: My Life as a Beach Boy hit shelves. The book is published by Blue Rider Press, a member of Penguin Group (USA).